Its hard to understand why, but Mike Anderson from The BikeHutt was a little disappointed with the weather last saturday. Mikes 2nd Cyclocross race of the year sported the best weather for an off-road event that I have seen since......well, since his last Cyclocross event on July the 4th! Well Cyclo-cross (CX ) is supposed to be all about racing around a short muddy circuit while plastered from head to toe in mud and sweat. There was plenty of sweat, but the mud pretty much stayed on the dry firm ground. The course was still challenging, and favoured the CXers more than in the last event, which had a short muddy hill in it. I am pretty sure Mike was hanging out for some more mud! Mike had the traditional CX man-made obstacles placed in exactly the right spot to bust your rhythm. CX is a great sport for the family and spectators with a constant stream of riders coming past the start finish - most people taking between 2 and 4 minutes to do a lap. Mike held a 1 lap kids race which could easily become a big feature if the word gets out. These courses are fully doable by any kid with 2 wheels, and you know that's a very rare thing in hilly Wellington. This time around there was more Coffee and and an impressive mobile Pizza Oven from NYPD Pizzas. 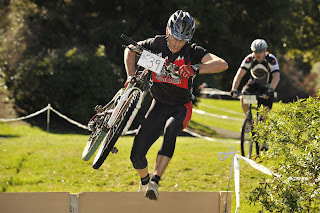 Craig Madsen was there taking pix with Cycletech supplying extreme value for money prizes given the $5 cost of entry! The saturday morning time-slot might be a tough one to fill with family's and kids sport but time will tell. Top image supplied by Craig Madsen.